“TAX REVOLTS, JOB PROTESTS, FOOD RIOTS, SQUATTER REBELLIONS, will occur in America,” predicts Gerald Celente, the CEO of Trends Research Institute. With regard to a tax revolution, Celente says overtaxed Americans will either be fed up, not willing, or unable to pay their taxes which will ignite a battle against DC’s traitorous politicians to force the rollback of general taxes while demanding higher tax rates for those seen as paying too little. JOB RIOTS COMING TO AMERICA? “A STANDOFF CONTINUES AT A CHICAGO FACTORY as workers protest layoffs after being told their plant was being shutdown,” as reported by ABC News on December 7, 2008. Some 250 workers at Republic Windows and Doors stayed inside their Chicago plant, in shifts, even though the company has told them that - as of December 9 2008 - their jobs no longer exist. “Chicago is a working class town. We’re gonna stand together until we win this battle,” one union leader said. Members of other unions rallied outside of the plant in support of the Republic workers occupying the factory inside. Workers blame Bank of America for losing their jobs when told that the factory was forced to close because Bank of America cut off financing. Key Jewish leaders are concerned that the workers’ anger towards Bank of America may signal a possible nationwide backlash against Jewish control of America’s banking and economic systems. As scandal after scandal unfolds, overloaded with Jewish names, there is fear that rank and file Americans will begin to see who the majority of their controllers ultimately are. The outrage prompted politicians, including even now-disgraced Governor Blagojevich, to jump on the anti-Bank-of-America bandwagon calling for a halt in doing business with the bank. Fifteen Chicago City Council members, concurring with Blagojevich, said they will introduce an ordinance that will require Chicago to withdraw all funds from the Bank Of America. A similar protest occurred on August 14 2008 in St Louis where several hundred Chrysler workers protested job layoffs. 500 terminated employees, including several busloads of supporters, gathered across from Chrysler’s headquarters in Auburn Hills, St Louis, protesting the closing of the Minivan plant and the eliminating of a large shift from a nearby Chrysler truck plant. About 2,500 jobs were affected. America’s true unemployment numbers are now probably in the 20% range and the anger and resentment from these millions of now nearly hopeless citizens is bound to erupt on a major scale sooner or later. Worldwide, similar rage and unrest is being reported routinely. Recent protests in China, some violent, and various employment-related protests throughout Europe, may foreshadow what could soon take place in America. One protest that turned violent in China occurred on November 27, 2008 and saw five hundred laid-off workers rioting in Guangdong province in southern China. The workers smashed police vehicles and stormed into offices, breaking windows & computer monitors at the Kai Da Toy Factory which makes Nerf toys for the US company Hasbro Inc. Furthermore, one has only to look at events like the current Greek riots, and the airport takeover in Thailand, to get the bigger picture of what could transpire in the US from the economic catastrophe enveloping the entire planet. THE BESIEGED AMERICAN MIDDLE CLASS, millions of whom lost their jobs & homes during the recent meltdown in the US economy and mortgage market, is literally trying to survive in many cases. Thousands are building “tent cities” and living in cars and RVs and garages throughout America. Entire families are sheltering in tents with their possessions crammed in with them or spread out on the ground outside. There is often no primary electricity, no plumbing, no drainage. Portable showers offer a chance to wash, but there is nowhere to prepare food, apart from makeshift tables in the open air, reports the BBC. The property he lost is nearby in Ontario, which offers a middle-class suburban dream - complete with green lawns, wide pavements, and garages big enough for two cars. Yet Ontario is in an area known as the “Inland Empire” where the rate of foreclosures is the third highest in the entire US. Many other tent cities are springing up all across the US and North America with 5 major tent enclaves located in St Petersburg, FL, Phoenix AR, Seattle, WA, Las Vegas, NV, and Toronto, Canada. “This is just the tip of the iceberg,” reports Investors Insights. While Americans are forced to live in cars and tents, our ‘loans’ to Israel (NEVER repaid) continue to fund the inhuman starvation and genocide of the Palestinian people. The current blockade of Gaza is a disgrace to the human race…but the world looks away and does nothing. Zionist Israel answers to no one. To deal with the growing millions of unhappy, hungry and potentially unruly Americans, NorthCom command continues to ready its special operations under the heading of “Civil Disturbance Planning” against “civil unrest” in America…which could very well lead to massive martial law and full and open dictatorship. This article, “America’s Coming Civil Anguish,” was prepared, written, formated, re-written, edited, picture created, with much “anguish.” It took over 2 days to research it and then many hours, many-many hours, to get it “post ready.” The computer crashed on me during the final touches and I am now entirely exhausted. But, it’s worth it all, don’t you all think? Our site, Real Jew News, is dedicated to making sacrifices for The Truth. And I thank you all for your readership. Some of you know that Pay Pal banned me owing to the ADL’s intimidation, falsely calling our site, Real Jew News, a “hate site.” So, for three days, I & my Web Manager searched for a new way to keep Real Jew News online. Please see the beginning of all December articles, including this one, for the new Donation feature. Sacrifices need to be made for the Truth. Only a few of over 250,000 unique visits per month actually donate anything. Once I put the new Donation Feature up last week, only 3 people donated. Some, not a lot, send in donations by mail — ONLY A HANDFUL of Real Jew News readers are willing to make a sacrifice for the Truth. For these handful of readers surely understand that as Christ said, “The worker is worthy of his hire.” They include “blessings in Christ” with their donations. It is these who really encourage me to continue our battle. On another note, Real Jew News has many hidden costs. One such “hidden cost” is purchasing research materials. This past week I felt it necessary to join yet another “pay for news” News Site. I also purchased over $200 in necessary books, some of which are scholarship rare editions such as “The Rothcshilds & The Founding Of Israel.” I usually prefer to buy Hardcovers as it has lasting value. 1. Please Stay On Topic - I don’t care about quantity any longer, but quality. 2. Avoid Lengthy Comments - Keep it succint and to the point. Readers instantly tire when seeing dissertations and treatises. 3. Avoid Multiple Links - I will only allow 2 at the most from now on. 4. Pro Hitler/Nazi Comments Forbidden - Hitler was an occultist and Anti Christian. I do not want his name mentioned in a good light on Real Jew News. 5. Avoid Thick Texts - I do not have the time any longer to divide thick single paragraph texts into multiple paragraphs. Please do it yourselves. 6. 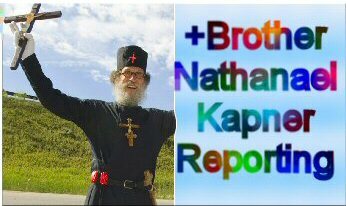 All Slanders/Discrediting of Br Nathanael Will Be Deleted - I get enough of this from Anti Christ Jews and stupid Zionist-Christians. I have put too much time, anguish, struggle, money, into Real Jew News to allow readers to come on with no cost to them and slander and discredit me. 7. Use Good Grammar & Sentence Structure - If you have something to say then say it well. Fr Joseph, Joe Cortina, Katherine-Julianne, Michael K, James, etc do an excellent job in this regard. I found this very interesting. You know about the romanian prophet Dumitru Duduman? He stated that the whole chapter of Revelation 18 is America. God sent an angel to show him the end of America, this Utah prophet states the same thing. Russia is going to destroy America with nuclear weapons.What do you think?AN AMERICAN MOMENT: Road to the inauguration In Utah, the Parowan Prophet predicts disaster will prevent Obama from taking office. Leland Freeborn and 12 other survivalists meet every Monday at his home. The group believes Leland is a prophet and they come to hear his predictions. ‘He will not be the next president,’ Leland Freeborn warns those who will listen. He and his followers expect nuclear explosions this Christmas season. Reporting from Parowan, Utah — Our trip to the Parowan Prophet began with a letter to the St. George Spectrum. It was set among missives proposing that oil companies bail out Detroit automakers, that county inmates be forced to winter in tents, that lawyers be barred from public office. A rough crowd. This particular letter to the editor in the St. George, Utah, newspaper carried the headline ” ‘Prophet’ shares grim forecast,” and it was signed by one Leland Freeborn of Parowan, who wrote that he was known to many as the Parowan Prophet. These riots, according to his prophecy, will encourage the “old, hard-line Soviet guard” to seize the moment and rain down nukes on the United States, killing at least 100 million of us. It took an hour to reach the prophet, a high-country drive through stunning red-rock formations, the color of which matches the politics in this corner of southern Utah. A freeway billboard, depicting a nuclear mushroom cloud, provided directions to the prophet’s two-story house. The frontyard seemed a staging ground for rapid flight — two or three motor boats, a raft, a canoe, a recreational vehicle and an old sedan, parked with its engine running. The man who answered our unexpected knock wore a cowboy hat with a big feather stuck in the band, and a beard suggestive of St. Nick. We asked to see the prophet. He said we had the right guy. Freeborn hobbled out the door on crutches and eased into a wheelchair on the porch. As it turned out, he was heating the car not for rapid escape from a nuclear cloud, but to take a neighbor to the doctor. “I only have nine minutes,” he said. It was enough time to sketch out his history — a Mormon of substance, a father of 12, he had crashed his airplane in 1975 and fallen into a three-week coma, during which he went through “to the other side” and emerged a prophet. Freeborn, now 66, took “a plural wife,” as he put it, and parted ways with the church. He forfeited his wealth, spreading word of his prophecies. He appears to live now mainly on sales of newsletters and survival information packets advertised on his website. Asked for examples of successful prophecies, he offered O.J. Simpson’s murder acquittal and Al Gore’s winning of the popular vote in 2000. But his core insight has been a repeated dream of seeing nuclear flashes to the west while shopping at a Wal-Mart during Christmas season. And this, he warned, appears to be the year. As Freeborn rose to leave, he said he would be hosting a weekly religious meeting that night. He urged us to come. There were about a dozen believers in the two front rooms, men and women of all ages, squeezed together on couches and dining room chairs. All of them had broken with the Church of Jesus Christ of Latter-day Saints over polygamy and other departures from what they believe was the original vision of the church founder Joseph Smith. And all said they regarded Freeborn a prophet. The cluttered room was filled with Bibles and religious tracts, government maps depicting potential nuclear targets, and framed photographs of mushroom clouds. December 14, 2008 “The Times” — -AS a convoy of blue-and-white United Nations trucks loaded with food waited last night for Israeli permission to enter Gaza, Jindiya Abu Amra and her 12-year-old daughter went scrounging for the wild grass their family now lives on. Conditions for most of the 1.5m Gazans have deteriorated dramatically in the past month, since a truce between Israel and Hamas, the ruling Islamist party, broke down. Israel says it will open the borders again when Hamas stops launching rockets at southern Israel. Hamas says it will crack down on the rocket launchers when Israel opens the borders. The fragile truce technically ends this Thursday, and there have been few signs it will be renewed. Nobody knows how to resolve the stalemate. Secret talks are under way through Egyptian intermediaries, although both sides deny any contact. Israel controls the “borders” and allows in humanitarian supplies only sporadically. Families had electricity for six hours a day last week. Cooking gas was available only through the illegal tunnels that run into Egypt, and by last week had jumped in price from 80 shekels per canister (£14) to 380 shekels (£66). He has four days of food in stock for distribution to the most desperate - and no idea whether Israel will reopen the border. The Abu Amra family may have to eat wild grass for the foreseeable future. TITLE: Disaster Capitalism: The new economy of catastrophe. “…After each new disaster, it’s tempting to imagine that the loss of life and productivity will finally serve as a wake-up call, provoking the political class to launch some kind of “new New Deal.” In fact, the opposite is taking place: disasters have become the preferred moments for advancing a vision of a ruthlessly divided world, one in which the very idea of a public sphere has no place at all. “…Every time a new crisis hits—even when the crisis itself is the direct by-product of free-market ideology—the fear and disorientation that follow are harnessed for radical social and economic re-engineering. Each new shock is midwife to a new course of economic shock therapy. The end result is the same kind of unapologetic partition between the included and the excluded, the protected and the damned, that is on display in Baghdad. “…As Iraq and New Orleans both reveal, the markets opened up by crises aren’t only the roads, schools, and oil wells; the disasters themselves are major new markets. The military-industrial complex that Dwight D. Eisenhower warned against in 1961 has expanded and morphed into what is best understood as a disaster-capitalism complex, in which all conflict - and disaster-related functions (waging war, securing borders, spying on citizens, rebuilding cities, treating traumatized soldiers) can be performed by corporations at a profit. what is the way to get out of this sinful organisation ? as written in the bible, “do NOT stay amonsgt them!” (the sinners). Come OUT! you are RICH, example you have surely somehow to feed for 2 years in your houses. ‘poor countries’ has to live for 1/2 days in their houses. that’s the only way i can see to reduce the violence of the punishment to have let installed SIN in LIFE. God bless you and He does. Brother, are you prepared physically? Guns, ammo, food, water? I know you have your faith, but peter carried a sword you know. Just concerned. It is coming, and we want you to survive as well through it to see the light of day that awaits after we take the Country back. Tent cities sprout all over the US, yet our tax dollars continue to build luxury condos all over Israel. Then we fly people in from Russia free and pay their rent in the condos we build after they move in. Go figure! This is an open letter to all pro-zionist agencies who want to limit the free speech of Bro, Nat., (proven) myself and others for our truthful statements concerning the zionist/ashkenazi plague across this world. How can you zionists such as the adl etc. complain about anti-semitism when it is YOU, THE ZIONIST/ASHKENAZI who contemplate, conspire and thru cabalic alchemy… devine this atrocious wickedness on the world?. PERHAPS TO GLEAN THE COMPASSION OF THE WORLD ONCE AGAIN AS YOU DID WITH ENGLAND AFTER WW2, AS YOU WERE GRANTED THE LAND OF PALESTINE UNLAWFULLY BY ENGLAND - THEY HAD NO AUTHORITY TO GIVE THIS LAND TO YOU OR ANY OTHER PARTY. Now you commit genocide against the very people who this land belongs to! in contrast to your complaints of hate speech etc., what do you call this?, the murder of thousand of innocent’s!. You are of your father, the devil-this is self admitted within the talmud, but why are the statments contain there-in not considered hate-speech against the Christians/JESUS CHRIST?, I say you are hypocrites. May GOD bless Bro. Nat. in his plight for the truth, his light shining the path, and his courage an example for all of us to stand up against this evil. It is better to die one death in courage, then one thousand deaths in cowardice, at the feet of the adl/nwo/luciferian cabal. I truly feel for all the people losing their jobs but thats what they get for selling out to some big corp in the first place. A job is as much a gamble as the stock market and getting angry when it crashes is silly. Jobs are our servitude and its good people are losing them, maybe now they will find something else. This is a by product of ultra dependency. Who will survive the next few years? It appears that we’re overshadowed by a global depression initiated by a planned financial collapse on Wall Street, and it spread globally. Foolish investors are weeping as the big bear stands prominently atop of a dead bull. Of course we know from glimpsing the past annuls of history that an unprecedented chaotic period is at hand, and will envelope not only the United States of America, but all other nations as well. Job losses attributed to NAFTA and GATT, has proved beyond any shadow of doubt, instrumental to the demise of the American economy and thereby creating an atmosphere of discontentment among the unemployed. The burden of the welfare state coupled with the necessities of the underemployed and the unemployed, will in it’s entirety be cast upon all the greedy churches which value the dollar above that of the soul, and will reject the poor in their hour of need. They have been suckered into the “Faith Based Initiative” which makes them an extension of the government. The good fundamental churches of our land will suffer extreme hardship that’s attributed to depleted contributions, of a desperate society striving for a meager existence. The ambushing of grocery trucks headed for the market will enhance food shortages caused by drought and farm foreclosures, and carbon emission laws, the stores will be looted and shelves emptied. Bank and store robberies will be escalated, houses will be ransacked, and murder will be the norm. Mayhem will inevitably arise from empty stomachs as a doggy-dog situation demands survival of the fittest mentality. Racial tensions that are now being promulgated by the media will at that time reach a boiling point, and will spill over into the highways and byways of our land. The turbulent sixties would have appeared to be the eye of the storm in comparison to the volatile uproar that’s certain to come as in the “Mad Max” movie. Pandemonium will prevail over so much of America, that the basic structure of local law enforcement will not be able to subdue the situation. A national emergency will be decreed, and martial law will be declared and enacted at first in major cities, and then nationally as soldier troops patrol the streets. As civil unrest floods into suburbia, and the affluent of society nestled in their lavish homes start to feel the heat from the fire of indifference, desperate cries will be made to summon help from anyone, anywhere. What an appropriate time for the satanic New World Order (NWO) establishment to exercise its domineering power to restore “Order out of chaos”, The sojourned ignorance of foolish men will respectively accommodate not only the National Guard, FEMA, etc., but also a United Nations presence, to quench the violence of a lit powder keg. Riding upon the heels of this anarchy will be implemented a gun confiscation program as outlined in the 1961 State Department Document 7277, to further subdue a nation in tyranny. But, this blatant violation of the second amendment will not be served on a silver platter, as to no opposition from true patriots. Patriot and militia organizations will form pockets of resistance from coast to coast, in their attempt to fight for the same constitutional freedoms that their forefathers so validly died for. This civil war will surpass all others in recorded history as to the number of dead, and both the blood of the oppressors and that of the martyrs will flow fro the streets of the cities to the rural countryside. The helicopters now training under the guise of urban terrorism, equipped with infrared detection and firepower, will be utilized in relaying strategic assault information to ground combat forces, in a joint effort to eliminate all resistance. The deterioration of the global economy and breadbasket will be a major catapult for a world raging in war. United Nations troops will be dispatched globally to offset riots, and more will eventually be summoned to the United States to replace a massive desertion of its armed forces personnel. Christians at this time will finally read the handwriting on the wall, and will unite their efforts in one accord, against the satanic NWO’s campaign for global dominance. They will prove their salt, as they deal a severe wound to this continental head of the satanic NWO, but, it’s wound will be healed as the fire of democracy is quenched, (Revelation 13:3). Dissenters from every walk of life and those listed on the red/blue list will respectively be rounded up, and taken to one of the many new federal detention camps. It’s quite possible that Rails to Trails throughout this land will become human highways. Meanwhile, a beastly economic system similar to the G-7/8/20, will have assumed the role to lead not only world economics as they now do, but also an Interpol force, adherent only to the views of the global village/UN. The Jerusalem issue will be negotiated into a Palestinian stronghold for east Jerusalem, in a mutual exchange for a new Jewish temple built on the Temple Mount with a wall dividing the Temple. At some point in time, the Antichrist will confirm this convent for seven years, only to break it three and one half years later, when literally all hell breaks loose in Israel. Nevertheless, the satanic New World Oder will centralized its economic and military power base. Continental currencies such as the euro, and a proposed “amero” for North America, and all global currencies will be replaced when a world currency is issued, consequently nullifying all existing treasuries. American sheeples will soon have the wool pulled over their eyes by deceitful prominent Protestant leaders to the extent that they will command total obedience to a wicked government. They will brainwash gullible Christians using Romans 13:1-7 as their biblical reference. Although a careful examination of those verses talk about obeying good rulers, not evil ones, (verse 3 says, “For rulers are not a terror to good works, but to the evil”). Throughout the bible, godly people have ignored evil laws and proclamations given by evil rulers (see Ex 1:17, Dan 3:18, Acts 4:19, etc.). I certainly hope that multitudes, which no man can number, will refuse the global order given to take the mark, name, or number of the beast in Revelation chapter 13. Mostly all religions will deliver their flocks to the authority of the false prophet (2 Thes. 2:9, Rev. 19:20). The love of the only true God will wax cold as all these New Age, humanistic, pagan elements combine their abominable practices with the Muslims, Hindus, etc. to form a one world religion. An embodiment of wickedness known as the antichrist will become the political voice of representing the functional capacity of the economic/military machine, (see Revelation 13:1-10). He will accommodate the leader of the world church by forming the last beastly system for societal dominance, (see Revelation 13:11-12). The antichrist will break the convent he confirmed with Israel at midpoint of the 7 year tribulation, (see Daniel 9:27), and will then commence genocidal atrocities against the Jewish race, (Jacob’s trouble). Ten leaders in subjection to the antichrist will destroy Babylon (possibly Brussels) (see Revelation 17:12-13), and in conjunction with him shall dominate the global economy and military force. Thirty days after the invasion of Jerusalem, and the consequential cessation of the daily sacrifices and oblations, the abomination of desolation will be set up in the temple, (see Daniel 12:11). The religious leader will then command total allegiance and worship to the antichrist and his system and will demand all the inhabitants of the Earth to receive the mark of his name (666) in their right hand or forehead (microchip implant, etc.) (see Revelation 13:16-17), which will be required to conduct any financial transactions. Everyone who refuses to accept the Devils mark in compliance with his system, will be executed by decapitation, (see Revelation 20:4) Don’t take the mark ! No… worldwide we will force an end to false democracies, (dictatorships) and ensure NO TAX except for those using OUR resources and land for profit, proceeds from which will go directly to citizens. We will eradicate LAW and replace it with JUSTICE and we will eradicate slave economic systems and replace with a Money Up Front system and so end global poverty. Governments by anyone other than the people, the real people, are soon to be history. End your programming. Realise Money is currently used to hide criminal fraud. It comes out of thin air. It’s a confidence trick. The bankers are to lose everything, including their lives along with those supporting them. Choose your side carefully, because I know who wins. And you can stick your NWO where the sun don’t shine! Thank you Br. Nathanael for everthing. We do not need to worry of anything. We must follow His teachings and we will be fine. Something must be done to help the people in Gaza. One picture speaks a thousand words. He who does not bellow the truth when he knows the truth makes himself the accomplice of liars, forgers and murderers. “Put thy sword back into its sheath; for he who lives by the sword shall die by the sword,” said our Lord & Saviour, Jesus Christ, the Eternal Son of God become man for our salvation. Then Christ put the ear back on Malchus the servant whose ear St Peter cut off. I have the Lord’s protection. We are exhorted by our Precious Saviour, the Lord Jesus Christ, to seek first the kingdom of heaven, then all other things: food, clothing, protection, raimenent, housing, will be added unto us. Brother, Your website is of outstanding quality and I enjoy your views. Would love to contribute $’s to it, but too strapped right now myself. However, I am putting a plea out there to anybody reading these pages with an abundance of money, to support this man in his noble endeavors. Beacause the truth is a struggle within a false paradigm system built upon lies, propaganda and deception. Somebody with the means please step up and fund this righteous man with a monthly fund that will enable him to carry forward his toils without so much sruggle, bless your heart whoever you may be. So be it. Regarding “Nicolae’s” input about the Parowan Prophet, Leland Freeborn,I would not place any credibility with a Mormon “prophet” in any respect. It does not matter that Leland has a history of being “accurate” with past predictions. Taking such as validation merely leads to perdition for those gullible enough to go along with it. When Leland speaks of nukes, he may find himself the casualty of one followed by consequences he could never foresee yet may have been forwarned by true believers. Yes, that’s right, the festival of Hannukah is nearly upon us, and that time of year when Talmudic Jews do everything that they can to rain on the hated rival Christmas parade using both the emotional argument of how excluded they (all 2.5% of the population) feel by all of the joyous public Christmas celebrations, and also, of course, the constitutional argument about the separation of religion and state, which they often take to court to get public Christmas symbols, like cribs, removed, or huge menorahs erected next to Christmas trees in the interests of “balance”. 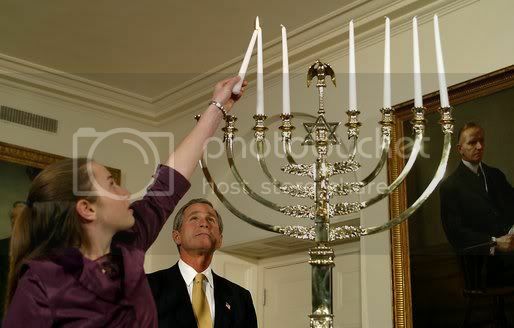 Funny how there is not much evidence of the separation of religion and state in the photograph of George gazing in awe at the menorah, but then the jews have always believed in the principle of “do as we say, not as we do” and “one law for you and another for us” for the goys. Mormonism is that not the religion that said Jesus and Lucifer were brothers? And they have a questionable historical connection to Freemasonry. Did he predict the O.J acquittal before the case came to trail or afterwards? I predicted O.J would be acquitted when they played the race card. It was after the Rodney King LA riots so they did not want another race riot. The Al Gore thing is a 50/50 guess. How come he didn’t predict 9/11? I predicted Milosevic would be killed before the trail was coming to an end and I am no prophet. It was obvious he would be murdered because despite years at the Hague tribunal they could not charge him with a single count of what he claimed he did and they would never let him go free as the trail was coming to a close. Also another defendant was murdered and Milosevic prior to his death believed he would be killed. Plus I have a future prediction that they will be a nuclear bomb explosion or an attempted one on NATO head quarters in Brussels and it will be blamed or linked to Russia in some way between mid January and early February judging by statements in Obama’s staff, foreign leaders and Obama’s appointees. Merry Doomsday from the Parowan Prophet…again. The word “Parowan” in Paiute means “Evil Water” from a local Native American legend concerning “Little Salt Lake”. Parowan is a central theme in the eschatology and messianic settlement of the early Mormons. Mr. Freeborn used the passage from 2 Peter 13 to justify his latest 2008 predictions, keying in on the word “riot” in the sense of ‘civil disorder’ now being publicized. In this particular passage, the Greek word is ~truphe~, or ~enfeeble~, esp. the mind or body by indulgence. It specifically means ~effeminacy~, ~luxury~ or ~debauchery~. He should double check with a ‘Strong’s Concordance’. Parowan is also in the vicinity of the infamous “Mountain Meadow Massacre” of the Baker-Fancher wagon train party on its way to California, when the Mormans disguised themselves as Paiutes, and incited the local natives to join the attack upon the peaceful wagon train for purposes of robbery and mayhem and child kidnapping. Anyone interested in the history of Mormonism, a suggestion would be ~One Nation Under Gods~ by Richard Abanes. (Yes, ‘Gods’ in plural). It is a well researched, concise and piercing historical overview of Morman teachings and development, which includes many things often intentionally suppressed by leaders of the LDS. Seems to me we have better things to do than to listen to “clanging gongs” who boggle the reasoning mind about our very real and serious problems going on. By healing the ear of the Jewish high priest’s servant (cut off by St. Peter in St. John’s Gospel account and one of His ‘followers’ in the accounts of St.Matthew, St. Mark and St. Luke) Jesus clearly exhibited to one and all His total Divine Control over the situation of His arrest. Jesus asks all of His arresting party “Am I am brigand…?” Do the soldiers and the Jews render an honest, sincer and truthful answer? No. So His betrayal and His arrest are both unjust and are typical human injustices carried out by orders from ‘higher ups’. Nearly 2,000 years later, nothing much has changed. All the military might used against Iraq and Afghanistan on trumped up charges stemming from the 9-11 ‘Arab Terrorist’ attacks by orders from ‘higher ups’. Does the servant of the Jewish High Priest confront the High Priest with the ‘Facts’, with the ‘Truth’? If he did, the High Priest ignored him or dismissed him to the unemployment lines or maybe saw to his servant’s death as well. The Roman civil govenor finds Jesus innocent, yet abdicates his responsiblity to the citizens of Ceasar’s Empire. How many political officer holders here in the USA and its manifold Law Enforcement agencies to include those in the U.S. Military and DOD establishment have abdicated their responsibilites to their own fellow US citizens and their own fellow US Soldiers, Sailors, Airmen and Marines. “The Lie Is Sacred” - a summary of Stalin’s geo and national political thought and philosophy. This must be one of your most powerful articles, in my opinion. Celente has also been on the Alex Jones show describing these ‘predictions’ and -as you may be glad to hear - Russian trend researchers have been claiming much of the same to happen in America. They also believe, as Celente does, that we will break into regions. I’m not sure what the impact of that actually happening would be on this so-called North American Union…I know for a fact these ‘Amero’ coins the plant and agent and KKK member Hal Turner has been parading around with are a total hoax. I’m beginning to even doubt this merger of nations, somewhat, or at least I do not believe it will come to pass before 2010. Then again, it’s interesting that Bush signed into action this SPP deal just months before this market meltdown really began. This depression could all just be part of their plan to weaken the US to the point of diffusing with a nation such as Mexico, but then why such a global scale? I believe our controllers have lost control. Was it a punishment, did he mean to do it or was it an accident? That St Peter would cut of a servant’s ear and Jesus reattached it is good and all but if I were the servant I would want revenge for having my ear cut off. After all it was Jesus not St Peter who healed it. Support Ethnic Ashkenazim Against Zionist Israel! “…Martillo … came with strong and startling conclusions: the real issue is not Palestine. Unless they are neutralized, Israel lobbying groups, Israel advocates, Zionists, Neoconservatives, and [neoliberal] Friedmanites will steal America [is stealing] and effectively abolish the Constitution in all but name to create a society of servitude for all Americans except for those belonging to the hyper-wealthy transnational Zionist political elite. “This is exactly our view: Palestine is a symbol, a quintessence of the trouble, but the real issue is our enemy’s attempt to enslave the world. … In his view, in order to understand Jews, it is not necessary to venture into days of Jesus Christ; history of Poland will do. He goes to the days of ~Rzeczpospolita~, the Polish Commonwealth (from 1505 until 1795), [w]hen ethnic Ashkenazim constituted economic elite of the realm. They lost this status in the partitions of Poland. This is the destroyed Temple; in Martillo’s view, these are good old days the Jews miss. They want to be the elite as they were in the days of ~Rzeczpospolita~. Jews did well after the collapse of the Polish Commonwealth, notes Martillo, but not the level as they would have liked. “…In the US, the Jews (or Ashkenazim, in Martillo’s terminology) resurrected their social structure and rebuilt it, like ants, who rebuild anthills after being removed to a new ground. This structure is ostensibly “Israel advocacy” or “Israel Lobby” but actually advocating Israel’s cause (”Israel Lobby proper”) is a small part of its effort. He soberly states that a USA, whose dominant elite is Jewish, is not necessarily bending to the Israel Lobby proper when it pursues of pro-Israel foreign policy. The State of Israel may be a client state of America, but America is a client state of the American Jewish Zionist elite, which is…in the process of establishing itself as the permanent national “meritocratic” elite. The jew mafia takeover of EU. This takeover will start November 21, there will be nobody in the EU-parlement - except these mafia jews that hails to themself. When America fall so will IsraHell. So I hope IsraHell will not do something foolish to destroy America as we know it. Straightforth questions warrant straightforth answers. The All-Good God and Creator of all that is seen and Unseen took on our human (physical) nature 2,000 years ago. The recorded espisode of Christ Jesus, God Incarnate, of healing the Jewish High Priest’s ear after one of His disciples cut it off is meant to teach/affirm to ALL peoples that He, Christ Jesus, is perfectly capable of “setting things right” - even a very small thing as healing a Jewish High Priest’s servered ear. How else would you expect an All-Good Incarnate God, Creator of All that is seen and Unseen react, respond and behave amongst the people of our Earth? Without the fullness of His Divine Grace and Life working in us we, too, simply continue to exhibit the spiritual weakness, ignorance and afflictions of our fallen human natures. …unless we indivdiually are granted some measure or degree of God’s Divine Grace, we cannot help but to fall into the temptation of passively ‘following the crowd’. Without His Divine Grace, we truly haven’t ‘A Clue’ as to what the Real and True Solution to our living-life problem(s) are. Our entire human race is in dire need of a ‘Second Pentecost’ coupled with a ‘Global Exorcism’ of our planet earth’s human race. That will occur when the Hiearchies and Bishops of His Church OBEY His Instruction to have Russia publicly and solemnly Collegially Consecrated to His Mother’s Immaculate Heart. Your comment about wanting revenge even after having your severed ear restored ‘cuts to the chase scene’ with respect to our human spiritual natures and God’s Divine Graces. It was a great Divine Grace for the Jewish High Priest’s severed ear to be restored to him. The true and real inner spiritual disposition of the Jewish High Priest’s servant would have been made manifest to those there at the time. However, the servant’s response, reaction and following human behavior is not recorded in the Gospel accounts. I would venture to say that IF a part of your body were cut off and restored to you by God Himself, after some thought, you’d use your human nature to THANK God rather than forgetting all about God and His Gift of Love to and for you so as to throw yourself into the cauldron of boiling vengeful thoughts and actions. There is a huge difference between the ‘hypothetical’ and the ‘real/actual’. God can restored ’severed ears’ as well as ’severed spiritual relationships’ between men and Himself. While our ‘world’ continues on in its path of historical degeneracy at the hands of so men Christ-rejecting men and women of our time, there is no need for you to follow them into ‘The Pit’. By Priestly advise - go to any Catholic or Orthodox Priest requesting that he hear your confession so as to obtain God’s Forgiveness. Next, do avail yourself to as many Masses or Divine Liturgies as you can attend. I am pretty sure there will be much more unrest coming up. When a person is hungry their logic is different and politicians will face that, definitely. Though I think we should be careful of so-called prophets and keep in mind that we do not know God’s plans, and for some to claim that they DO is not humble at least. Not all revelations are divine, and it is well known in Orthodox Christian tradition, especially that evil spirit can appear in form of an angel or even Christ and speak stuff to a naive person. I am thinking (only my opinion) that if someone is Protestant or Baptist, who are not used to divine imagery in their worship environment, if that person gets some voice or appearance they could be tricked so easily. But anyways, all I know for now, it’s important not to lose focus on priorities, which is life in Christ. I am trying myself and most often unsuccessful, yet I know its worth trying. Too coincidental to be just a coincidence: first, money out, next, career over. Thanks a lot for your very interesting and timely article. I had difficult time reading it. The fact that so many people in US and Canada are living in “tent cities” is just killing me…. and not only this. But things are going to get worse and we have to get ready with whatever comes and Pray to our Spiritual Creator for help. Personally, I am not afraid because my fait in GOD is Strong!!! I presume you are Roman Catholic? Russia is a Catholic country ( Orthodox) Being Orthodox we already are devoted to the Theotokos. The Irish Government have recently stated their intention to re-run the Lisbon Treaty (or EU Constitution). Its passage would be a major step towards Zionist power consolidation and the New World Order. Tell that “hardens hearts” nonsense to the millions of Christian believers who have been martyred down through history at the hand of atheist monsters like Stalin and Mao. Personally, I wish I could get a little freedom from the unbelievers who have so totally screwed up life in America. In an unrelated Christmas story from the Netherlands, a gay group in Amsterdam has organized a “Pink Christmas” festival featuring a nativity scene with two Josephs and two Marys. The rationale for this bizarre display is “to increase the range of options for homosexual men and women during the Christmas holiday week” and to “encourage people to think about homosexuality and religion.” Just what I want to think about at Christmastime. Also in England, the popularity of chaste pop idols like the Jonas Brothers has not been exalted. In fact, girls caught wearing “purity rings,” signifying that they wanted to remain virgins until marriage, were forced to remove them. Apparently, the authorities didn’t want the slutty girls to feel ostracized. In Congress, Rep. Charlie Rangel (D-NY), after having violated about half of the federal tax laws, is staying on as chairman of the tax-writing House Ways and Means Committee. Meanwhile, Sen. Chris Dodd and Rep. Barney Frank, the king and queen of congressional oversight of the banking industry, are still in charge of running their respective asylums. Frank, whose boyfriend ran a prostitution ring out of the congressman’s townhouse back in 1990, and who more recently was involved in a homosexual affair with an official of Fannie Mae, one of the bankrupt quasi-governmental entities Frank oversees as head of the House Financial Services Committee, sees no conflict between his public and personal life. Pay no attention to that little gay man behind the curtain. Speaking of Congress, the heads of the so-called Big 3 auto manufacturers were summoned to Capitol Hill for a little public flogging before handing them their bailout money. Of course, they had to be humiliated further for daring to fly in to Washington on their corporate jets (an admittedly stupid PR move when begging for billions in public alms). The great irony here is that Speaker of the House Nancy Pelosi has a jet available to her at all times as well. Not to worry, though, because the auto makers have been so cowed that they drove to DC in their own “green” vehicles the next time they came calling with their hands out. It’s like “One Flew Over the Cuckoo’s Nest” meets “Mr. Smith Goes to Washington.” Except that Mr. Smith is in a straight jacket in a rubber room while the loons run the asylum. While it is true that Russian Orthodox Christians DO and HAVE a great love and devotion to the Mother of God, that does not necessarily mean all of the Khazar Jews of Russia do, or the militant secular pragmatic materialistic Communists, the many Russian Muslims, Russian Buddhists, Russian ‘Whatevers’! The Love and Divine Providence of GOD knows no merely human-set boundaries. Nor does the Love of the Most Holy Theotokos know any merely human-set boundaries, human conventions, human machinations, etc. The Mother of God’s LOVE for all of Humanity desires for all peoples to come to know and TO LOVE her Son Who just so happens to have been made King of kings and Lord of lords by His Eternal Father. Now ‘The Bolsheviks’ and the Khazar Jews, their Central Bank Dynastic Private Owning Families’ here in the US/NYC, in the UK/London, in Israel/Tel Aviv might NOT like that, but Divine Facts remain Divine Facts. The Bolsheviks, the Khazar Jews, their Zohar/Occult satanic worshipping Financial-Banking backers, their bought-and-paid-off national political officer holders in any and all nation/states across this World of ours HAVE caused those of us of the Human Race so much grief, anguish, suffering during the past century and previos centuries that our Merciful Lord and Savior wanted to ‘put a line in the sand’ saying ‘Enough Is Enough’ of their evil machinations and conspiratorial ways with a public and solemn Collegial Consecration of Russia to the Mother of God. What true blooded Theotokos loving Russian Orthodox Christian would protest/reject such a sublime spiritual victory for their Chrisitan nation and the peoples of the World? Forgive me for not directly answering your implied question, whether I’m Roman Catholic or not. Yes, I was Baptized and Confirmed in the ROMAN Rite of the Catholic Church. I do take it that you understand that there are various other ‘Rites’ of the Catholic Church as their are in the Orthodox Church. Next, with respect to my ordination into the Priesthood. That was an entirely unexpected ‘from-out-of-the-Blue’ moment of Divine Grace granted to me, personally, by our Lord and Savior, Jesus, the Christ. Gosh, I can still recall the night He visited me ‘in Spirit’ to convey to me His Offer! And I took Him up on it. Simultaneously, He impressed upon the mind and heart of my Metropolitan Archbishop Athanasius the Idea of ordaining me into the Priesthood of the Church’s Monastic Brotherhood. And off I went to visit the Metropolitan to receive my ordination. My Metropolitan Archbishop showed me his Episcopal Lineage and Succession…his goes way back to the BISHOP OF MOSCOW! Boy, was I surprized! I take it you are most familiar with St. Tikhon, Patriarch of Moscow, during the times of the Bolshevik Revolution. So, being under my Metropolitan’s Omophorian, his Bishop’s Coat-of-Arms bears his Bishop’s mission of ‘Repair the Breach’ between the Orthodox and Catholics. So, I’m a Priestly “hybrid” , having to show my loyalty to BOTH the Bishop of Rome, his Bishops and to Patriarch Tikhon and his Bishops. Not an easy task at all! Too many centuries have passed with so much antagonisms and animosities between Catholics and Orthodox. Theologically, the ‘filioque phrase’ need not be a dividing factor between the Western and Eastern Church. But so many NEED such strife and divisions and arguments in order to substantial and sustain their particular role/posture. My dilemma, as a Priest in the Church’s Monastic Brotherhood, with respect to my Metropolitan Bishop’s mission/ministry to and for His Church always, always, always boils down to the public and solemn Collegial Consecration of RUSSIA to the Immaculate Heart of the Most Holy Theotokos. The Masons/Satanists/Modernists holed up in ‘The Vatican’ displacing loyal/devout Catholic Bishops are preventing the pubilc and solemn Collegial Consecration of RUSSIA on the one hand - AND - the obstinate refusal of those in and throughout the Orthodox Hiearchy & Laity will have nothing to do with an Apparition of the Most Holy Theotokos in a very real Catholic country such as Portugal! And there, my dear John, is my personal Priestly “burden” to bear. Russian Church and her Christian people. There, I hope THAT answers your implied question! Fr Joseph, MANY of the various and sundry ‘Orthodox’ jurisdictions that are a plethora here in the USA, claim the same. The question I would ask is, are you Orthodox, or UNIATE? IF Uniate, then you are nothing more than a Roman Catholic in ’sheep’s clothing,’ as far as the HISTORY and PRAXIS of the Orthodox Church is concerned. If you are ‘Orthodox’ (as opposed to RC, just to clear the air of terms, and their usage) then WHY are you following a FALSE APPARITION, that NO ONE within Orthodoxy admits to being authentic. St Mark of Ephesus, three regional COUNCILS OF the CHURCH, the anathemas that are contained therein, ALL OF THEM AGAINST THE FILIOQUE, and the philosophical damage that has arisen from it (in fact, the ENTIRE edifice of the West, to be blunt) are not merely ‘adiaphora.’ YOUR LYING COMMENT about those that ‘need’ such strife beggars the imagination. Are you a dog, that has to return to its’ vomit over and over again, when you have been told that the ENTIRE ORTHODOX CHURCH is against you? Bernard L. Madoff has run off with the store so to speak — the store of cash that is, which Judaics from Steven Spielberg to Elie Wiesel had stashed with this agent of of the world’s second oldest profession, whose patron is that hoary old rascal who Shakespeare dubbed Shylock and the am-haaretz on the Lower East Side call the goniff. I hesitated writing this column because the acolytes of Wilhelm Marr are coming out of the woodwork pointing to the Judaic ethnicity of Madoff, as if there are not a legion of gentile crooks and con-men running amok in the stock market these days, fleecing peasantry and gentry from coast to coast. A crook is a crook, whether Catholic, Hindu or Talmudic, and in my view they should all be hanged with an equal length of rope. Madoff’s enormous heist (do my eyes deceive me when I grok the sum of $50 billion?! ), interests this newshound precisely because it undercuts a stereotype of the Jew-haters: that Judaics are always the “smart money,” evincing a fiduciary adhesion surpassing the strongest bonding agents in Das Kapital’s marketplace: always robbing gentiles and profiting communally from the rip-off. This sub-cellar stereotype is actually misdirection emanating from a resonance of rabbinic propaganda that has been covertly seeded in right wing ranks ever since Hitler chose the Protocols over Entdecktes Judenthum as his movement’s signature reference work. Contemporary professional anti-semites push a post-modern version of this disinformation when they maintain that Judaism, or its potent offshoots, Judaic culture and tribalism, always defraud gentiles while enriching Judaics. This is sheerest ignorance reflecting a sound-bite knowledge –of the little bit is dangerous variety — of the posek’s sacred Torah SheBeal Peh. Contrary to the received opinion, Judaism is not good for Judaics. Any religion that inculcates cheating God is going to end up having its followers cheat each other. They may cheat the gentiles first, but sooner or later they’ll give each other a haircut too, and not just on Lag B’omer. Judaism runs the gamut from one-upmanship over God to the enslavement of married couples by the torturous and labyrinthine halachos of Niddah (laws on menstruation). S’iz shver tsu zayn a yid (”It’s no fun being a Judaic” –my translation). It is certainly true that Orthodox Judaism teaches that under certain circumstances, the Neshama HaElyonah-deficient subhumanity otherwise known as the goyim are fair game for every imaginable theft and deception. Furthermore, Orthodox Judaism holds that even God can be fooled through the superior brain-power of the lawyer-like posek ha-dor. Kol Nidrei is but one of many institutionalized examples of a lawyer’s loophole created so as to defraud God of promises that were made to be broken. Business ethics are equally compromised. Honesty is not highly prized in Judaism if it threatens the standing of the rabbis or the fortunes of the tribe. The creepy Khazars who ran the kashrut slaughterhouse in Iowa are only the most recent example of this praxis. The goniff Bernie Madoff is not a renegade. He is the terminal Talmudic man that the Jewish self-haters who created Judaism have constructed from the golden calf which they have worshipped in preference to Yahweh, for more than 3,000 years. Bernie’s prodigious swindle proves a point which this writer has been making against intense opposition from the Henry Ford wing of the Right: the biggest victims of Judaism are not gentiles but Judaics themselves. That’s why the world’s most virulent Judaic-haters, the Protestant fundamentalists and the modern Vatican pontiffs, encourage Judaics to remain in their synagogues, while exalting Orthodox Judaism as truly representative of a divine and eternal covenant. As a function of Judaism itself, Madoff has brought misery down upon the heads of his fellow Judaics. For those who have eyes to see: “anti-semitism” was borrowed from Wilhelm Marr in order to disguise the long history of this communitarian torment. To understand this paradox will require a paradigm-shift away from everything the agents of the rabbis have seeded in our ranks for hundreds of years. The words of truth are often paradoxical: those who would save Judaics from the Madoffs of the world must necessarily save them from Judaism itself. Contrary to the bubbe meises told to the bochurim, the Esau who hates Jacob for all eternity (”Halacha hi beyoduah she’Eisav soneh l’Yaakov”), is not the authentic follower of Yeshua the Nazarene; rather he is the authentic exponent of the Misheh Torah and the Mishneh Berurah. Ethical behavior (”mitzvos bei Adam L’Chavero”) is so often found lacking in Talmudic business practices contracted even between Talmudists. The man who will cheat God and the gentiles who sustain the nation that harbors him, will cheat his co-religionists with equal impunity, as Yeshiva University, the Elie Wisel Foundation for Humanity, Norman Levy, the UJA, Mortimer Zuckerman, the Jewish Federation of Greater Washington, the North Shore-Long Island Jewish Health System, Rabbi Haskel Lookstein’s Ramaz School, the Jewish Community Centers Association of North America, the Carl and Ruth Shapiro Family Foundation, the Jewish Federation of Palm Beach, SAR Academy, and Spielberg’s Wunderkinder Foundation, are all learning to their dismay. A ready means of destroying Judaics would be to suppress any violence or vandalism against them and leave them to rabbinic Judaism. Without an “anti-semitic” alibi to distract them from their religiously-institutionalized penchant for self-destruction, the Bernie Madoffs of their world would channel their inner-Esaus and reduce Judaism’s adherents to a collection of feuding bankrupts. Only a lover of Judaics would endeavor to dissuade them from their toxic and self-annihilating theology, society and culture which generates predators possessed of the dizzying manipulative skill, remorseless mercantilism and “inevitable moral abasement that this sort of treachery fosters in its practitioners” of a Bernard L. Madoff. The layman, Photius, installed by the Byzantine Emporer as a Bishop of the Church displacing the duly assigned and installed Bishop - this Photius asserted that the Holy Spirit proceeds ONLY from the Father. Photius contradicted Jesus’s Own Divine Revelation regarding His Father, Himself and the Holy Spirit. When we stop blowing smoke at each other, when we drop the rhetoric, when we honestly and sincerely seek the truth of the matter with respect to the Catholic/Orthodox Schism, the REAL issue is not the ‘filioque’ phrase. The REAL issue here is whether or not a civil ruler/leader can DISPLACE a Bishop of the Church with his or her own personally ‘chosen/prefered’ private theologian! There is nothing new under the sun. The King of England started his own ‘church’ by getting rid of those Bishops and ‘theologians’ not to the liking of the King of England. The Peace of Augsburg capitulated the Catholic position that civil rulers and leaders cannot ‘choose’ what sorts of private theologically inspired ‘religions’ they would like to impose on their citizens. Just exactly who has temporal jurisdication over and within the Church here on earth? The Bishops or the Civil/Empire Rulers? Now THAT is the real underlying reason for the Catholic/Orthodox split. One either sides with the Byzantine Emporer OR with the Bishop of Rome! This is going to be the END of this thread, please my dear friend, Fr Joseph. I vehemently disagree with you both regarding the procession of the Holy Spirit and your discrediting of our holy, Orthodox Christian hierarch, St Photious the Great, whom we consider along with St Mark of Ephesus and St Gregory Palamas, a Pillar of Orthodoxy. First of all, if you maintain that the Holy Spirit proceeds both from the Father and the Son, then you create a gross distortion in the Holy Trinity. For thus, as St Photios the Great points out in his masterpiece, “The Mystogoy Of The Holy Spirit,” then the Holy Spirit must ALSO proceed from the Holy Spirit Himself in order to maintain an equality in the Holy Trinity. Then the perpetuation of the Holy Spirit from Himself will continue endlessly. This is only one of the many distortions introduced by the heresy of the filioque. And this heresy has NEVER been resolved in our dialgoues between our Orthodox Church and your Roman Church. It is now 3 AM in the morning and I will NOT continue this discussion again. END OF THREAD dear Father, even though you know I love and respect you. We will simply have to agree to disagree on this one, unless you find it in yourself to acknowledge the truth. As regards, our holy and beloved, St Photios the Great, he was canonically and legally elected to the patriarhate. This has even been now admitted by many Roman Catholic theologians and historians. Very informative information my brother Nathanael! I do see this decline in America`s economy too! One thing that is not mentioned though is when these riots begin as financial or hunger/food riots, they MOST CERTAINLY will turn into ethnic/racial riots as well! Our treacherous anti-Christian government or (ZOG) Zionist Occupied Government, in my humble opinion, acts against our nation’s interests by allowing massive non-Christian immigration to flow this country, that don`t have any longer have the resources to care for our native born Americans!!! God bless all your efforts!